The Eighteen 25 apartment community is opening in downtown Houston. Design: Meeks + Partners. 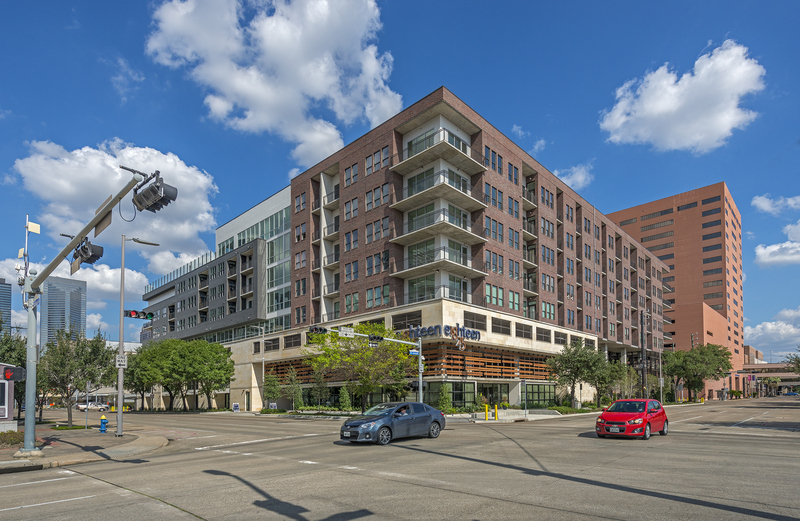 HOUSTON – (Realty News Report) – Construction is wrapping up for the Allied Orion Group apartment development, Eighteen25, in downtown Houston. The project is designed by Houston-based Meeks + Partners, and includes eight floors of apartments over three levels of parking. It is near the Pierce Elevated and the Co-Cathedral of the Sacred Heart. The new multifamily community, 1825 San Jacinto St., is one of a number of new apartment projects sparked by the Downtown Living Initiative, which gives developers $15,000 per unit in tax benefits. Apartment developers have responded to the Downtown Living Initiative, which is intended to inject more vitality and economic health to downtown Houston. Downtown Houston had been criticized for years – and investors had shied away from deals – because the Central Business District lacked 24-hour activity. Allied Orion Group’s 242-unit apartment community features studio, one, two bedroom and loft options with a total of 342 parking spaces. Unit sizes range from 525 – 1,751 SF, and include private balconies and optional storage. “Eighteen25 is a true live/work/play community and offers young professionals a high-quality rental option with all the conveniences of downtown living,” says Ryan Meeks, AIA, Partner with Meeks + Partners. The modern unit design features polished concrete floors, quartz countertops, stainless steel appliances with gas stove cooking and 10-foot ceilings. A fourth floor landscaped courtyard offers a park-like retreat and a first floor secure dog park and dog wash area is provided for pet lovers. Initial resident move-ins have begun and construction is estimated to complete fourth quarter 2017. Eighteen25 is designed to meet the National Green Building Standards Bronze Certification criteria.